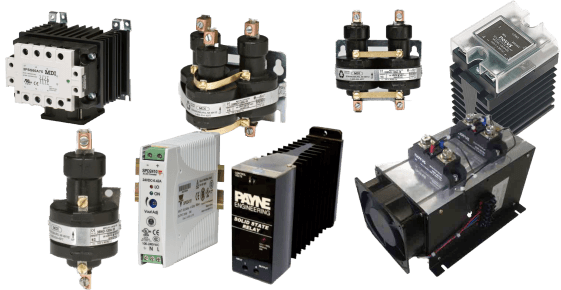 Power Controls | Gordo Sales, Inc. Solid state relays deliver the high precision power modulation and smooth power output to the load that ensures your process stability. Since everything (including the controller) is solid state there are NO moving parts which give MUCH longer life and MUCH faster switching. Typically used to replace mechanical contractors or mercury relays, solid state relays provide reliable and cost effective power control. The solid state relays listed below use a 4-32VDC pulse to fire, by far the most common, however if you need AC fired solid state relays give us a call. Mercury Displacement Relays are all designed and built to meet the most exacting demands of industry. They have won their high place in the electrical field by doing the tough and tricky jobs that ordinary equipment could at best do in an uncertain manner. They have proved their ability to stand up under the most adverse conditions of temperature, dust and moisture, in all types of applications. All the care required for the manufacture of high-grade instruments is used in the manufacture of the switches. All switch parts are specially cleaned, and contamination is avoided by use of tweezers, gloves, etc., when making assemblies.Contactors are hermetically sealed with high quality glass to metal seals. The stainless steel tube is totally encapsulated in high grade UL approved epoxy to prevent moisture damage and voltage breakdown through the protective coating.The coils are wound on compact nylon bobbins and molded onto the metal tube to provide minimum power loss. This allows for low coil power required to actuate the contactor. This also enables the units to handle high loads with minimum derating due to higher ambient temperatures.Inert gases internally prevent excessive arcing between the mercury and the electrodes which enables the unit to function for millions of cycles with very low contact resistance, and minimum deterioration of the internal parts. Available in all standard coil voltages, in single, two and three pole arrangements. Other coil voltages available upon request.In multiple pole units each tube is actuated by its own coil. This eliminates pull-in variation between contact tubes, assuring consistent switching. Browse these categories under "Power Controls for Process Heating Systems"